The mammillary bodies are part of the diencephalon, which is a collection of structures found between the brainstem and cerebrum. The diencephalon includes the hypothalamus, and the mammillary bodies are found on the inferior surface of the hypothalamus (the side of the hypothalamus that is closer to the brainstem). The mammillary bodies are a paired structure, meaning there are two mammillary bodies---one on either side of the midline of the brain. They get their name because they were thought by early anatomists to have a breast-like shape. The mammillary bodies themselves are sometimes each divided into two nuclei, the lateral and medial mammillary nuclei. The medial mammillary nucleus is the much larger of the two, and is often subdivided into several subregions. What are the mammillary bodies and what do they do? The mammillary bodies are best known for their role in memory, although in the last couple of decades the mammillary bodies have started to be recognized as being involved in other functions like maintaining a sense of direction. The role of the mammillary bodies in memory has been acknowledged since the late 1800s, when mammillary body atrophy was observed in Korsakov's syndrome---a disorder characterized by amnesia and usually linked to a thiamine deficiency. Since then a number of findings---anatomical, clinical, and experimental---have supported and expanded upon a mnemonic role for the mammillary bodies. 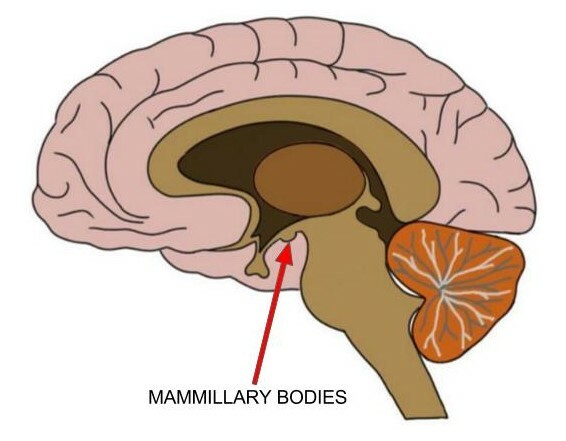 The mammillary bodies are directly connected to three other brain regions: the hippocampus via the fornix, thalamus (primarily the anterior thalamic nuclei) via the mammillothalamic tract, and the tegmental nuclei of the midbrain via the mammillary peduncle and mammillotegmental tract. Two of the three connections are thought to primarily carry information in one direction: the hippocampal connections carry information from the hippocampus to the mammillary bodies and the thalamic connections carry information from the mammillary bodies to the thalamus (the tegmental connections are reciprocal). These connections earned the mammillary bodies the reputation of being relay nuclei that pass information from the hippocampus on to the anterior thalamic nuclei to aid in memory consolidation. This hypothesis is supported by the fact that damage to pathways that connect the mammillary bodies to the hippocampus or thalamus is associated with deficits in consolidating new memories. Others argue, however, that the mammillary bodies act as more than a simple relay, making independent contributions to memory consolidation. Both perspectives emphasize a role for the mammillary bodies in memory but differ as to the specifics of that role. Further supporting a role for the mammillary bodies in memory, there is evidence from humans that suggests damage to the mammillary bodies is associated with memory deficits. Several cases of brain damage involving the mammillary bodies as well as cases of tumor-related damage to the area of the mammillary bodies suggests that mammillary body damage is linked to anterograde amnesia. Indeed, mammillary body dysfunction has been identified as a major factor in diencephalic amnesia, a type of amnesia that originates in the diencephalon (Korsakoff's syndrome, an amnesia that is seen primarily in long-term alcoholics, is one type of diencephalic amnesia). Experimental evidence from animal studies also underscores the importance of the mammillary bodies in memory. Studies with rodents and monkeys have found deficits in spatial memory to occur after damage to the mammillary bodies or the mammillothalamic tract. In addition to involvement in memory functions, there are cells in the mammillary bodies that are activated only when an animal's head is facing in a particular direction. These cells are thought to be involved in navigation and may act somewhat like a compass in creating a sense of direction.